With the Feast of Our Lady of Mount Carmel approaching on July 16, here is a link to an online publication of The Scapular by Carmelite historian Patrick McMahon, O.Carm. In seven short parts, Fr. McMahon considers the history of the Brown Scapular and its place in the modern world. There is a new post on the subject at Fountain of Elias. In honor of today's Feast of Our Lady of Mt. Carmel, Zenit has posted a previously unpublished article by Father Kieran Kavanaugh, OCD, titled Brown Scapular: A "Silent Devotion". In it, he speaks to the current state of historical research and the significance of the brown scapular and the feast of Our Lady of Mt. Carmel. Fr. Kavanaugh is a member of the Institute of Carmelite Studies well known for his translations of the works of St. Teresa of Avila and St. John of the Cross. ICS Publications recently published A Better Wine, a collection of essays celebrating his 50 years in the priesthood. As reported in the ICS Fall 2007 news online, he now has to his credit modern English translations of all of the works of St. Teresa of Avila and St. John of the Cross, a life's work. Yesterday, Elena Maria Vidal posted an article on "Marie-Antoinette and the Carmelite Order" on her blog Tea at Trianon. She mentions the ties between Carmelites and the French nobility that date back to the Middle Ages, as well as Marie-Antoinette's ties to the Carmelite nuns of Compiègne who, like her, died at the guillotine in the French Revolution. July 16 is the feast of Our Lady of Mount Carmel, a solemnity for Carmelites. In statues of Our Lady of Mt. 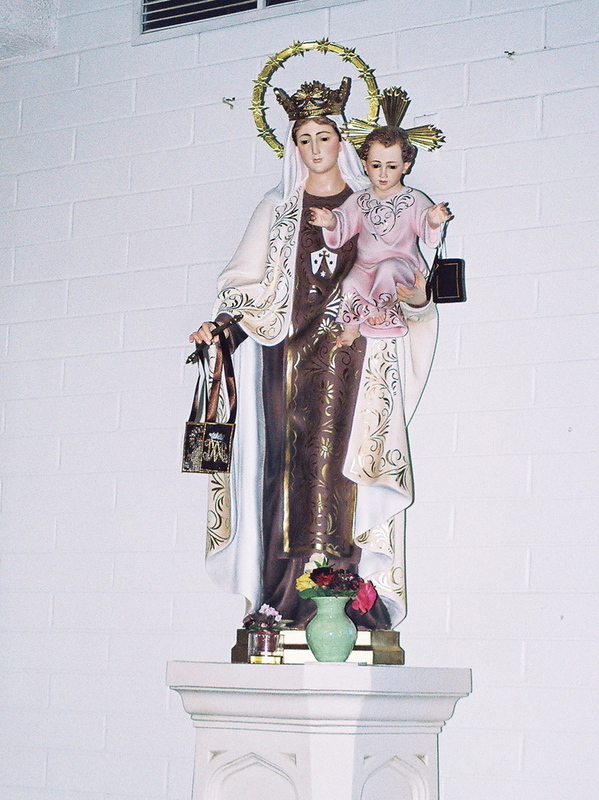 Carmel (like the one shown here from the El Carmelo Carmelite Retreat Center), Mary and Jesus are depicted holding small scapulars -- smaller versions of the scapular worn as part of the Carmelite habit. The day is particularly remembered for Mary as the patroness of the Carmelite family, with particular devotion to Our Lady for her protection and the long history of particular devotion to her by Carmelites. The devotion is rooted in Scripture and in the Carmelite history going at least back to hermits who lived on Mt. Carmel during the Crusades, who dedicated their oratory to Mary, and who were known as the Brothers of the Blessed Virgin Mary of Mount Carmel. According to tradition, moreover, Mary gave the scapular to St. Simon Stock in a vision in the thirteenth century. That tradition, and related legends, are the subject of this post, which will look at the views of recent Carmelite historians and the Church's present stand on them. This post will also consider the present day sacramental of the brown scapular of Our Lady of Mount Carmel and its deep and continuing significance to those within and outside of the Carmelite orders. In the "Carmelites: History" category of this blog, you will find a series of posts begun a year ago about the stories and legends of Mount Carmel. Each post considers a legend found here or there and considers how much historic fact there is within the story. An earlier post last year spoke of Carmel as the Order of Our Lady, looking more particularly at the life of Mary as known from Scripture and her connection to Mount Carmel in the Holy Land and to the Carmelite hermits and saints. This post will consider legends mentioned briefly in that earlier post: the stories of visions of St. Simon Stock and Pope John XXII and the Sabbatine privilege. The legend of St. Simon stock's vision of the Blessed Virgin giving him the scapular, and related legends giving a special indulgence to Carmelites and those who wear the scapular (including the Sabbatine Privilege) are probably the best known of all Carmelite stories. However, the stories involve a combination of fact and fiction. Simon Stock was a real person whose feast day has been approved by the Holy See as an optional memorial for Carmelites. Pope John XXII was of course also a real person. As recently as 2001, Pope John Paul II mentioned St. Simon Stock's vision in which the Blessed Mother is said to have given him the Carmelite habit. However, the Sabbatine Privilege is based on an apocryphal papal bull that has been found by the Holy See to be wholly unfounded, and Carmelites have been admonished not to spread that belief since the 17th century. Nonetheless, the stories remain among the most widely known and treasured of the stories of Mt. Carmel. Indeed, a search of the web today would probably turn up more sites that report the Sabbatine Privilege as doctrine than sites that report it as legend. You will find the legend here, here, here, and here, among the various websites that record it. In contrast, the Carmelite Website (O.Carm.) reports that Simon Stock was an English prior general who died in Bordeaux around 1265. Stories of miracles he performed date back to soon after his death. However, it was not until around 1400 that the story sprang up in the Low Countries that Our Lady had visited him and given him the scapular. In the story, she said to him, "This is a privilege for you and your brethren: whoever dies wearing it, will be saved." Within a few years, two versions of the story had developed. In time, it was elaborated with details about his life: He was said to have been born in Kent, to have lived as a hermit in a tree, and to have written the Flos Carmeli. In fact, those stories originated in the fifteenth century, while the Flos Carmeli can be found in the fourteenth century and thus pre-dates the legend. As the story spread, the memorial of St. Simon Stock became part of the Carmelite Order's liturgical calendar, celebrated on May 16. It was removed from the calendar in the reforms following Vatican II, but has since then been restored and authorized by the Vatican as an optional memorial for both O. Carm. and OCD. St. Simon Stock has never been formally canonized or beatified, nor is there likely to be adequate historical documentation to warrant a future beatification. The order's devotion to our Lady grew stronger through another tradition that in 1251, a time of hardship for Carmelites, she appeared to the prior general, Simon Stock, to encourage him and give him the scapular as a pledge of her protection. The oldest written account of this vision comes 150 years after the alleged event, a gap considered too wide for certainty especially in light of the medieval fondness for clothing a spiritual or theological belief in a story. What is more, it now appears certain that the prior general from 1247 - 1256 was not Simon Stock, but a certain Godfrey, whose name appears as prior general on recently discovered legal documents. . . . Not until the nineteenth century did historians begin to stress the necessity of establishing facts through meticulous research and discriminating criticism. Fr. Patrick McMahon, O.Carm., in writing about The Scapular suggested that the Carmelite hermits on Mt. Carmel would not have worn a scapular, and that the scapular may have been introduced to the order in 1247 when two Dominicans were asked by the Pope to help Carmelites adjust to urban life. He mentions that the constitutions of the late 13th and 14th centuries had to insist that Carmelites wear their scapulars. Fr. McMahon comments, "This would be, of course, very strange, if the Blessed Virgin Mary had indeed appeared to Saint Simon Stock in 1254 as the legends tell us." Beyond the story of St. Simon Stock's vision, there is a further legend of papal approval by Pope John XXII, who is said to have had an appearance of the Blessed Mother. That pope is said to have issued a papal bull granting the "Sabbatine privilege" -- a special indulgence for Carmelites and the Confraternity of the Blessed Scapular. However, the bull is apocryphal. The legend of papal approval of the Sabbatine privilege has been specifically rejected by the Church since 1613, when the Holy See determined that the supposed decree was unfounded and admonished the Carmelite Order not to preach the Sabbatine Privilege. The unfounded story was that Pope John XXII had issued a papal bull dated 1322 in which he had said that the Blessed Mother had appeared to him asking that he grant an indulgence for the Carmelite Order and the Confraternity of the Blessed Scapular remitting a portion of the temporal punishment for their sins, and saying that the Blessed Mother would descend on the Saturday after their death to liberate them from purgatory and lead them to heaven. Both the message given in Simon Stock's vision (that those who die wearing the scapular will be saved) and the Sabbatine privilege (that Mary will come to lead them out of purgatory on the Saturday after their death) are problematic in that they suggest that wearing the scapular can have a role in eternal salvation and the forgiveness of sins. The scapular of Carmel, or the habit (also called by other names in different places), is one of the devotions most loved by the people of God. The great diffusion of the scapular seems to have been due to the tradition of a vision of Our Lady, documented at least since the end of the fourteenth century. "This is a privilege for you and the order: whoever dies wearing this Scapular will be saved. Later, it was widely believed that the Virgin would deliver from Purgatory, on the first Saturday after death, the Carmelites and people associated with them who observed chastity according to their state, recited prayers, and wore the habit of Carmel. This is the so-called Sabbatine Privilege. . . .
More recently, thanks to a deeper understanding of our tradition and the fruit of research and of the process of renewal in the whole Church, the approach to popular devotions and, therefore, to the scapular, has changed. Accompanying the Rite, a letter from the Carmelite Provincials in North America and Pastoral Comments by the North American Carmelite Provincials discuss the legends and the present day devotion to the scapular. Well-meaning people have often spread the devotion with extravagant claims that have no historical background and which sometimes are difficult to reconcile with sound Christian Doctrine. In our catechesis of the Brown Scapular of Our Lady of Mount Carmel, we Carmelites accept the mandate to clearly teach the doctrine that Church teaches and our Carmelite Rule affirms so well -- that Jesus Christ is the only one who liberates us from our sin. The Universal Church has entrusted the Carmelite Order with the responsibility for guaranteeing the authenticity of this devotion as it has been revised by the Holy See. Information offered by other groups is not necessarily in harmony with the approved practice of the Church. Stories and legends abound in Carmelite tradition about the many ways in which the Mother of God has interceded for the Order, especially in critical moments of its history. Most enduring and popular of these traditions, blessed by the Church, concerns Mary's promises to an early Carmelite, Saint Simon Stock, that anyone who remains faithful to the Carmelite vocation until death will be granted the grace of final perseverance. The Carmelite Order has been anxious to share this patronage and protection with those who are devoted to the Mother of God and so has extended both its habit (the scapular) and affiliation to the larger Church. Private revelation can neither add to nor detract from the Church's deposit of faith. Therefore, the Brown Scapular of Our Lady of Mount Carmel echoes the promise of Divine Revelation: "The one who holds out to the end is the one who will see salvation" (Matthew 24:13) and "Remain faithful unto death and I will give you the crown of life" (Revelation 2:10). The Brown Scapular of Our Lady of Mount Carmel is a reminder to its wearers of the saving grace which Christ gained upon the cross for all: "All you who have been baptized into Christ have clothed yourself in him" (Galatians 3:27). There is no salvation for anyone other than that won by Christ. The Sacraments mediate this saving grace to the faithful. The sacramentals, including the scapular, do not mediate this saving grace but prepare us to receive grace and dispose us to cooperate with it. . . . Historical research has shown that the alleged fourteenth century appearance of the Blessed Mother to Pope John XXII is without historical foundation. As a matter of fact, in the year 1613, the Holy See determined that the decree establishing the "Sabbatine Privilege" was unfounded and the church admonished the Carmelite Order not to preach this doctrine. . . .[T]he Holy See acknowledged that the faithful may devoutly believe that the Blessed Virgin Mary by her continuous intercession, merciful prayers, merits, and special protection will assist the souls of deceased brothers and sisters and members of the confraternity, especially on Saturday, the day which the church dedicates to the Blessed Virgin. Today, Catholic devotion to the Carmelite brown scapular is still strong. Pope John Paul II acknowledged that he had worn a scapular over his heart for a long time as a form of Marian devotion. While the Sabbatine Privilege is not taught, the tradition of Mary's appearance to St. Simon Stock has never been prohibited. There is simply too little historical evidence for it to be certain, and Carmelite historians regard it as a legend. However, on the 750th anniversary of the traditional year of that vision, John Paul II supported the tradition of Simon Stock's vision as the source of the Carmelite scapular. I therefore learned with deep joy that the two branches of the Order of Carmel, the ancient and the reformed, intend to express their filial love for their Patroness by dedicating the year 2001 to her, invoked as the Flower of Carmel, Mother and Guide on the way of holiness. In this regard, I cannot fail to stress a happy coincidence: the celebration of this Marian year for the whole of Carmel is taking place, according to a venerable tradition of the Order itself, on the 750th anniversary of the bestowal of the Scapular. This celebration is therefore a marvellous occasion for the entire Carmelite Family to deepen not only its Marian spirituality, but to live it more and more in the light of the place which the Virgin Mother of God and of mankind holds in the mystery of Christ and the Church, and therefore to follow her who is the "Star of Evangelization" (cf. Novo millennio ineunte, n. 58). . . . This intense Marian life, which is expressed in trusting prayer, enthusiastic praise and diligent imitation, enables us to understand how the most genuine form of devotion to the Blessed Virgin, expressed by the humble sign of the Scapular, is consecration to her Immaculate Heart (cf. Pius XII, Letter Neminem profecto latet [11 February 1950: AAS 42, 1950, pp. 390-391]; Dogmatic Constitution on the Church Lumen gentium, n. 67). In this way, the heart grows in communion and familiarity with the Blessed Virgin, "as a new way of living for God and of continuing here on earth the love of Jesus the Son for his Mother Mary" (cf. Angelus Address, in Insegnamenti XI/3, 1988, p. 173). Thus, as the blessed Carmelite martyr Titus Brandsma expressed it, we are put in profound harmony with Mary the Theotokos and become, like her, transmitters of divine life: "The Lord also sends his angel to us ... we too must accept God in our hearts, carry him in our hearts, nourish him and make him grow in us so that he is born of us and lives with us as the God-with-us, Emmanuel" (From the report of Bl. Titus Brandsma to the Mariological Congress of Tongerloo, August 1936). I greet with special affection the Carmelite Family, gathered here with a large group of pilgrims from many nations on the occasion of the meeting that commemorates the 750th anniversary of the giving of the Scapular. Dearly beloved, this happy event involves not only those devoted to Our Lady of Mt Carmel, but the whole Church because the rich Marian heritage of Carmel has become in time, thanks to the spread of devotion connected with the Scapular, a treasure for the entire People of God. Draw constantly from this wonderful spiritual patrimony in order to be credible witnesses to Christ and to His Gospel in daily life. With the Letter that I wrote last 25th March to the Superiors General of the Order of the Carmelites and of the Order of the Discalced Carmelites, I invited you to this special dedication. In it, among other items, I wrote that the Scapular is essentially a habit which evokes the protection of the Blessed Virgin Mary in this life and in the passage to the fullness of eternal glory. The Scapular also reminds us that the devotion to her must become a "uniform", that is a Christian life-style, woven of prayer and interior life. I hope that this anniversary may be for each one of you an occasion for personal conversion, for community renewal, in which we will respond to the divine grace which fortifies us on the path to holiness. Thus, while reliable historical evidence for the tradition is lacking, the tradition of the Virgin's appearance to St. Simon Stock is still accepted by many people, and the tradition was given support as recently as 2001 by Pope John Paul II. Where honored, it needs to be distinguished from the later story of the Virgin's appearance to Pope John XXII, and the story of the Sabbatine Privilege, which the Holy See has rejected. The Sabbatine Privilege, and simpler legends attributing salvific power to the scapular run afoul of the Catechism in that they would attribute to a sacramental the grace that can only come from Christ. As the Provincials wrote in their Pastoral Comment quoted above, "The Sacraments mediate this saving grace to the faithful. The sacramentals, including the scapular, do not mediate this saving grace but prepare us to receive grace and dispose us to cooperate with it. . . ."
Moreover, as to the tradition of St. Simon Stock's vision, even if it were true, it would be a private revelation and not part of "the deposit of faith" according to the Catechism as just quoted. 1. The authority of private revelations is essentially different from that of the definitive public Revelation. The latter demands faith; in it in fact God himself speaks to us through human words and the mediation of the living community of the Church. Faith in God and in his word is different from any other human faith, trust or opinion. The certainty that it is God who is speaking gives me the assurance that I am in touch with truth itself. It gives me a certitude which is beyond verification by any human way of knowing. It is the certitude upon which I build my life and to which I entrust myself in dying. 2. Private revelation is a help to this faith, and shows its credibility precisely by leading me back to the definitive public Revelation. In this regard, Cardinal Prospero Lambertini, the future Pope Benedict XIV, says in his classic treatise, which later became normative for beatifications and canonizations: “An assent of Catholic faith is not due to revelations approved in this way; it is not even possible. These revelations seek rather an assent of human faith in keeping with the requirements of prudence, which puts them before us as probable and credible to piety”. The Flemish theologian E. Dhanis, an eminent scholar in this field, states succinctly that ecclesiastical approval of a private revelation has three elements: the message contains nothing contrary to faith or morals; it is lawful to make it public; and the faithful are authorized to accept it with prudence (E. Dhanis,Sguardo su Fatima e bilancio di una discussione, in La Civiltà Cattolica 104 , II, 392-406, in particular 397). Such a message can be a genuine help in understanding the Gospel and living it better at a particular moment in time; therefore it should not be disregarded. It is a help which is offered, but which one is not obliged to use. The last sentence just quoted is significant: "It is a help which is offered, but which one is not obligated to use." Thus, even if one assumes that St. Simon Stock's vision of the Blessed Virgin was an actual historic event, no one is obligated to use it. If authorized by the Catholic Church, one is authorized, but not required, to use private revelation. The criterion for the truth and value of a private revelation is therefore its orientation to Christ himself. When it leads us away from him, when it becomes independent of him or even presents itself as another and better plan of salvation, more important than the Gospel, then it certainly does not come from the Holy Spirit, who guides us more deeply into the Gospel and not away from it. . . . We might add that private revelations often spring from popular piety and leave their stamp on it, giving it a new impulse and opening the way for new forms of it. Thus, the truth and value of the story of St. Simon Stock's vision must be evaluated by whether it leads us to Christ or away from him. If interpreted to present another plan of salvation, it does not come from the Holy Spirit. Again, although Cardinal Ratzinger did not at all mention the Sabbatine Privilege in that document, the document supports the Church's rejection of the legend at least to the extent that it entails the Sabbatine Privilege. However, the story of St. Simon Stock's vision has indeed left its stamp on the scapular. The Apostle says: “Do not quench the Spirit, do not despise prophesying, but test everything, holding fast to what is good” (5:19-21). In every age the Church has received the charism of prophecy, which must be scrutinized but not scorned. On this point, it should be kept in mind that prophecy in the biblical sense does not mean to predict the future but to explain the will of God for the present, and therefore show the right path to take for the future. A person who foretells what is going to happen responds to the curiosity of the mind, which wants to draw back the veil on the future. The prophet speaks to the blindness of will and of reason, and declares the will of God as an indication and demand for the present time. In this case, prediction of the future is of secondary importance. What is essential is the actualization of the definitive Revelation, which concerns me at the deepest level. The prophetic word is a warning or a consolation, or both together. In this sense there is a link between the charism of prophecy and the category of “the signs of the times”, which Vatican II brought to light anew: “You know how to interpret the appearance of earth and sky; why then do you not know how to interpret the present time?” (Lk 12:56). In this saying of Jesus, the “signs of the times” must be understood as the path he was taking, indeed it must be understood as Jesus himself. To interpret the signs of the times in the light of faith means to recognize the presence of Christ in every age. In the private revelations approved by the Church—and therefore also in Fatima—this is the point: they help us to understand the signs of the times and to respond to them rightly in faith. Where the tradition of St. Simon Stock's vision of the Blessed Virgin giving him the scapular is taken as true, then, the vision must be scrutinized by the Church and then actualized as it concerns us at the deepest level, recognizing the presence of Christ in our own age, and responding rightly in faith. Now then, to return to what I was saying about locutions, all the kinds I mentioned can be from God or from the devil or from one's own imagination. If I can manage to do so, I shall give, with the help of the Lord, the signs as to when they come from these different sources and when they are dangerous: for there are many souls among prayerful people who hear them. My desire, Sisters, is that you realize you are doing the right thing if you refuse to give credence to them, even when they are destined just for you (such as, some consolation, or advice about your faults), no matter who tells you about them, or if they are an illusion, for it doesn't matter where they come from. One thing I advise you: do not think, even if the locutions are from God, that you are better because of them, for He spoke frequently with the Pharisees. All the good comes from how one benefits by these words; and pay no more attention to those that are not in close conformity with Scripture than you would to those heard from the devil himself. Even if they come from your weak imagination, it's necessary to treat them as if they were temptations in matters of faith, and thus resist them always. They will then go away because they will have little effect on you. If the soul does not discern this great strength in itself, and if the particular devotion or vision help it not onwards, then it must not look upon it as safe. For though at first the soul is conscious of no harm, great harm may by degrees ensue; because, so far as I can see, and by experience understand, that which purports to come from God is received only in so far as it corresponds with the sacred writings; but if it varies therefrom ever so little, I am incomparably more convinced that it comes from Satan than I am now convinced it comes from God, however deep that conviction may be. In this case, there is no need to ask for signs, nor from what spirit it proceeds, because this varying is so clear a sign of the devil's presence, that if all the world were to assure me that it came from God, I would not believe it. Applied to the visions attributed to St. Simon Stock and Pope John XXII, related to the scapular, St. Teresa of Jesus would have rejected those visions as from Satan or human imagination, where they vary ever so little from the Scriptures, even "if all the world were to assure me that it came from God." Thus, there is no reason to believe that Church rejection of a legend that is inconsistent with Church teaching is in any way a reduction of Carmelite spirituality. Rather, the Carmelite saints would have rejected a vision on the same basis if shown that it was contrary to Scripture and Church teaching. And believe me the whole affair doesn't lie in whether or not we wear the religious habit but in striving to practice the virtues, in surrendering our will to God in everything, in bringing our life into accordance with what His Majesty ordains for it, and in desiring that His will not ours be done. Carmelites were devoted to the Blessed Virgin before the lifetime of St. Simon Stock, and devotion to the Blessed Virgin and the scapular derive their significance from Scripture and Church teaching separate and apart from Simon Stock's vision. Sacramentals do not confer the grace of the Holy Spirit in the way that the sacraments do, but by the Church's prayer, they prepare us to receive grace and dispose us to cooperate with it. "For well-disposed members of the faithful, the liturgy of the sacraments and sacramentals sanctifies almost every event of their lives with the divine grace which flows from the Paschal mystery of the Passion, Death, and Resurrection of Christ. From this source all sacraments and sacramentals draw their power. There is scarcely any proper use of material things which cannot be thus directed toward the sanctification of men and the praise of God." Accordingly, a scapular may sanctify almost every event of our lives with the divine grace which flows from the Paschal mystery of the Passion, Death, and Resurrection of Christ. But it draws its power only from that source, and not from an appearance of the Blessed Virgin in a private vision. Moreover, a scapular cannot confer the grace of the Holy Spirit in the way the sacraments do. By the Church's prayer, it can prepare us to receive grace from Christ and can dispose us to cooperate with that grace. The history of Marian piety also includes "devotion" to various scapulars, the most common of which is devotion to the Scapular of Our Lady of Mount Carmel. Its use is truly universal and, undoubtedly, its is one of those pious practices which the Council described as "recommended by the Magisterium throughout the centuries". The Scapular is imposed by a special rite of the Church which describes it as "a reminder that in Baptism we have been clothed in Christ, with the assistance of the Blessed Virgin Mary, solicitous for our conformation to the Word Incarnate, to the praise of the Trinity, we may come to our heavenly home wearing our nuptial garb". The imposition of the Scapular should be celebrated with "the seriousness of its origins. It should not be improvised. The Scapular should be imposed following a period of preparation during which the faithful are made aware of the nature and ends of the association they are about to join and of the obligations they assume". The intercessions from the Ritual for the Enrollment in the Scapular include a prayer that those who wear the Scapular "may live their baptismal vow to be clothed in Christ", that they be "an extension of the love which Jesus had for his Mother", and that they "may clothe themselves with the virtues of the most pure Virgin," among other prayers. The significance of the scapular is thus not diminished by considering the tradition of Simon Stock to be a beloved legend rather than historic fact. Instead, it retains its deepest meaning as "a sign of the motherly love of the Virgin Mary" and a renewal of baptismal vows to "put on our Lord Jesus Christ." This past Sunday, the memorial of the birth of St. John the Baptist, Pope Benedict XVI devoted his words at the midday Angelus to catechesis on the life of that saint. Later that day, I had a post based upon Abbot John Chapman's mention that Dionysius Exiguus and St. Benedict of Nursia believed that St. John the Baptist had been the founder of monasticism, and his disciples had been the first monks. The Benedictine Abbot Chapman then stated in a footnote that Dionysius had ignored the "Carmelite view" that St. John the Baptist had been a friar and the first General of the Carmelite order. He does not identify his source for the latter view, one of the stories of Mt. Carmel that is not supported by historical research and not accepted by historians (Carmelite or otherwise). Yesterday, I added a quotation from the Conferences of John Cassian, an earlier source than St. Benedict and Dionysius Exiguus, in which Cassian relates that the fourth century hermits St. Paul and St. Anthony (i.e., Paul the Hermit and Anthony of Egypt) imitated Sts. 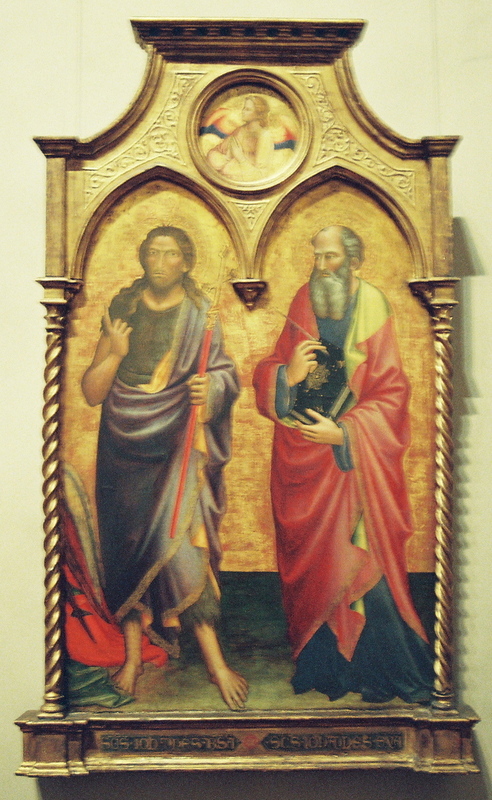 Elijah and John the Baptist. The fourth century saints were the first anchorites, according to John Cassian. Cassian spoke of Elijah and John the Baptist as greatly influential in the thinking of the desert hermits, but not as their founder. 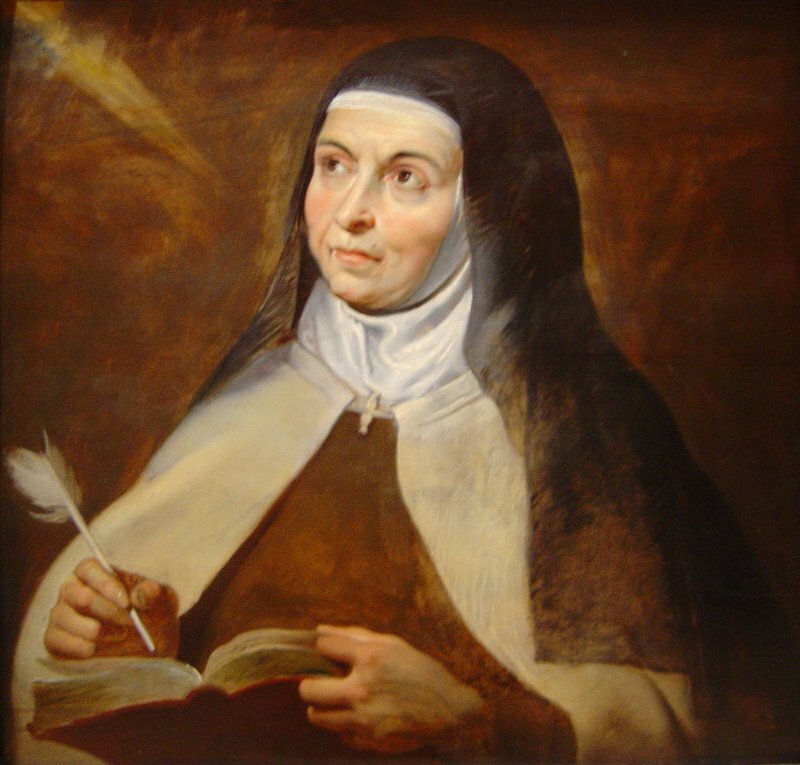 Cassian's writings were an important source of the thinking of St. Teresa of Avila and other great Carmelite saints about the early hermits. In that quotation, Cassian mentioned that John the Baptist had spent all his life in the desert, withdrawing into the desert like Elijah and Elisha, and he offered Scripture quotations about spiritual warfare and the lives of others who lived solitary lives in the wilderness. Tonight, here is one more source, St. Jerome's fourth century writing on the life of St. Paul the Hermit. St. Jerome is another important influence in the thinking of St. Teresa of Avila, discussed in this earlier post. St. Jerome mentioned the thinking of people of his own day who attributed to Elijah and John the Baptist the origin of the hermit life. They are "going back too far," wrote St. Jerome. Instead, he credited St. Paul the Hermit or St. Anthony of Egypt as being the true originator of the hermit life. St. Jerome both affirms that the belief already existed in the fourth century that the hermit life could be traced back to Elijah and John the Baptist, and also that the stories crediting them as founders were then already considered legends. The Life of the same St. Anthony, written by St. Athanasius, was mentioned by Pope Benedict last week during his weekly audience discussion of the life of St. Athanasius. "It has been a subject of wide-spread and frequent discussion what monk was the first to give a signal example of the hermit life. For some going back too far have found a beginning in those holy men Elias and John, of whom the former seems to have been more than a monk and the latter to have begun to prophesy before his birth. "Others, and their opinion is that commonly received, maintain that Antony was the originator of this mode of life, which view is partly true. Partly I say, for the fact is not so much that he preceded the rest as that they all derived from him the necessary stimulus. But it is asserted even at the present day by Amathas and Macarius, two of Antony's disciples, the former of whom laid his master in the grave, that a certain Paul of Thebes was the leader in the movement, though not the first to bear the name, and this opinion has my approval also. "Some as they think fit circulate stories such as this--that he was a man living in an underground cave with flowing hair down to his feet, and invent many incredible tales which it would be useless to detail. Nor does the opinion of men who lie without any sense of shame seem worthy of refutation. So then inasmuch as both Greek and Roman writers have handed down careful accounts of Antony, I have determined to write a short history of Paul's early and latter days, more because the thing has been passed over than from confidence in my own ability. What his middle life was like, and what snares of Satan he experienced, no man, it is thought, has yet discovered." In the "Carmelites: History" category of this blog, there are a few posts done last year on the stories of Mt. Carmel, with a look to how much truth may be found in a few of the old stories about the history of the order. The Carmelites trace their history back to European hermits living on Mt. Carmel during the Crusades, but we do not know the name of a founder of their order, nor can we identify a specific date when they began to settle there. St. Albert of Jerusalem, the bishop who gave them a rule, is the one name best known from that era. However, he was not a Carmelite. Hermits had lived on Mt. Carmel as far back as anyone could know, and the hermits of St. Albert's day lived near the well of St. Elijah, seeking to pattern their lives on the life of Jesus and on the lives of the hermits of the Early Church who were known from the writings of St. Jerome and John Cassian, among others. "I think St. Benedict knew also Dionysius's translation of the Invention of the Head of st. John the Baptist, for his two churches at Montecassino were dedicated to St. John and St. Martin, the latter the most celebrated Father of monks in the West, the former the patron (one would think) of solitaries rather than of cenobites. But the preface of Abbot Dionysius, addressed to another Abbot, Gaudentius, seems to explain why St. Benedict regarded the Baptist as the Patron of monks. It was a divinely ordered coincidence, says the Abbot, that monks should have discovered the head of the saint, and that an exiguous monk should publish the story for Roman ears: [Latin text omitted] . . . Here St. John the Baptist is definitely the founder of monasticism, his disciples being the first monks." "Dionysius therefore ignores the Carmelite view that St. John was not a monk but a friar: that the Carmelites founded by St. Elias were (like Benedictines) separate communities without a common head, in the days of the schools of the Prophets and of Pythagoras (the author of the multiplication table) and of other celebrated friars, but that the Baptist united them and became the first General of the order." Abbot John Chapman's biography of St. Benedict was first published in 1929. Today's Carmelite historians would not draw from those legends in writing the order's history. Compare the summary here of the presentation made about a week ago by Fr. Patrick McMahon, O.Carm., on the order's early history. Nor is much mention of that story made in the writings of Carmelite saints (none that I know of, anyway). The attribution to St. John the Baptist of a role as the order's founder is one of the stories of Mt. Carmel, a legend from the order's heritage. Yet, in the sixth century, according to Abbot John Chapman, Dionysius Exiguus and St. Benedict of Nursia considered St. John the Baptist to be the father of monasticism. Certainly, St. John the Baptist and his life as a hermit, as described in Scripture, became an example for the early Christian monks and hermits and for the early European Carmelites. "What can do you great harm is praise -- for once it starts it never ends -- if you are not careful, so as to humble yourselves more afterward. . . . You should never let a word of praise pass without it moving you to wage war interiorly, for this is easily done if you acquire the habit. . . . Look at the esteem [the world] had for St. John the Baptizer, for they wanted to take him for the Messiah, and how and why they beheaded him." This is a third post in a series on the stories of Carmel, looking at references to them in the writings of St. Teresa of Avila and at how much real historical fact there is within the legends. The first such post was about Elijah as the father of Carmel. The second was about the early hermits of Mount Carmel. The second of those posts contains some small mention of New Testament passages about Christianity spreading to the north and south of Mount Carmel during New Testament times, which may have some significance to this post too, although Mary was not much mentioned there. That post also quotes an excerpt from a fourteenth century French sermon about the history of the Carmelite order, which mentions that the early Christian hermits "built a Church or oratory in honor of the Holy Virgin, in a spot which, they had been told, she often frequented in her life, with her maiden companions. For this reason, they were the first among all religious orders to be called children of the Blessed Mary of Mount Carmel." This post is about the references in the writings of St. Teresa of Avila about the order as the Order of Our Lady, and the habit as Our Lady's habit, and how the Carmelite devotion to Mary reflects the memory of Mary's life in Nazareth, which is not far from Mount Carmel. The only part of Scripture that ties Mary to Mount Carmel is the proximity of the mountain and coast to Jesus's childhood home town of Nazareth. Of course, it is easy to imagine that a first century family living in Nazareth would have spent time together in the nearby mountains and by the sea. We know that the Holy Family traveled to Jerusalem for the Passover, a much greater distance. We also know that the New Testament mentions Jesus going into the mountains and hills to spend long hours, even the entire night, in prayer. It makes sense to think that his mother might have spent time in the mountains praying and meditating, and that he felt comfortable there alone at night having spent time in the mountains as a child. Aside from that kind of inference and guesswork, there is little historical evidence to tie the Holy Family, or Mary in particular, to Mount Carmel. The stories may have developed from exactly that kind of inference and imagination, or they may have been passed down through the centuries. It is not possible to know for sure, from historical records, whether she really walked there or not. Also, we do not know a lot about how Marian the early hermits on Mount Carmel were in their faith. However, devotion to Mary is something that marked the faith of St. John of Damascus, who was born and was educated in seventh century Damascus (north of Israel) and who is thought to have later become one of the Palestinian monks of the Great Laura of St. Sabas in Israel, south of Galilee. The canons of St. Andrew of Crete, who was born in Damascus in 660 and educated at the Monastery of the Holy Sepulcher of Jerusalem, also show a strong Marian devotion. The worst opponent of St. John of Damascus in the crisis over iconoclasm was Byzantine Emperor Constantine V, who opposed the use of images and references to Mary as the “Mother of God", and who later persecuted the entire monastic system. Thus, we know that other monks and hermits elsewhere in Palestine underwent persecution in the eighth century for their devotion to Mary, and it is thus likely that any monks and hermits then living on Mount Carmel were also persecuted for similar Marian devotion. The present day Carmelite devotion to Our Lady is not based on legends and stories. Rather, as mentioned in this earlier post, Pope John Paul II wrote that "Those who wear the Scapular are thus brought into the land of Carmel, so that they may "eat its fruits and its good things" (cf. Jer 2:7), and experience the loving and motherly presence of Mary in their daily commitment to be clothed in Jesus Christ and to manifest him in their life for the good of the Church and the whole of humanity." However, in the Middle Ages and in sixteenth century Spain, the Carmelite order was thought to date back to Jewish and Christian hermits who lived on Mount Carmel going all the way back to the time of Elijah. In that context, Mary, who was thought to have walked on Mount Carmel with her friends, was thought to offer special protection to the hermits on Mount Carmel. "Stories and legends abound in Carmelite tradition about the many ways in which the Mother of God has interceded for the Order, especially in critical moments in history. Most enduring and popular of these traditions, blessed by the Church, concerns Mary's promise to an early Carmelite, Saint Simon Stock, that anyone who remains faithful to the Carmelite vocation until death will be granted the grace of final perseverance. The Carmelite Order has been anxious to share this patronage and protection with those who are devoted to the Mother of God and so has extended both its habit (the scapular) and affiliation to the larger Church." "While praying in the church, before I went into the house, and being as it were in a trance, I saw Christ; who, as it seemed to me, received me with great affection, placed a crown on my head, and thanked me for what I had done for His Mother. On another occasion, when all of us remained in the choir in prayer after Compline, I saw our Lady in exceeding glory, in a white mantle, with which she seemed to cover us all. I understood by that the high degree of glory to which our Lord would raise the religious of this house." "He left this care to God for whom he left all, and decided to be a subject of the Virgin and take her habit. So they gave it to him amid the great happiness of all, especially of the nuns and the prioress. The nuns gave much praise to our Lord, thinking that His Majesty had granted them his favor through their prayers." 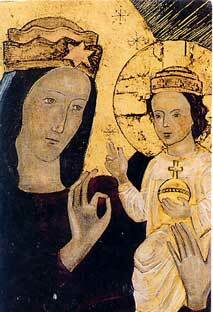 In Chapter 27, she refers to the Rule of St. Albert as "the primitive rule of the order of the Virgin, Our Lady". And in Chapter 28, she called the order "the order of the Blessed Virgin, Our Lady". In Chapter 29, she spoke of "an endeavor that was so important for the honor and glory of His glorious Mother since it concerned her order. She is our Lady and our Patroness. And this for me was one of the great joys and satisfactions of my life." In Chapter 30, she again calls it the "order of our Lady." 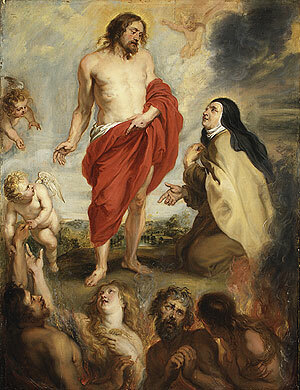 The two Rubens paintings shown here depict the Discalced Carmelite habit as shown by an artist who lived in the late sixteenth and early seventeenth centuries. 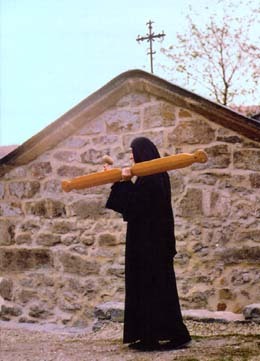 By comparison, the last two photographs show Orthodox Church nuns of the present day, whose habit is different in some respects, similar in others, but which serves to illustrate that the idea of nuns wearing veils and habits goes far back in time. Present day Orthodox habits differ from each other, as Catholic habits differ from each other, although the two shown here are alike. What caught my interest was the similarity of the veil itself, although Teresa of Avila may have never seen an Orthodox nun, and the Orthodox habit seems too unlike the Carmelite habit on the whole to have been derived from it. "The use of veils by women to cover their faces is a custom almost as old as humanity. The veiling of women in certain parts of the ancient Near East, for example, is manifested in the Middle-Assyrian law Code, in which a harlot or female slave may not veil her face, but all other women must veil themselves when appearing in public. The custom of women veiling their faces in public was common in Palestine in the first Christian century, but St. Paul found it difficult to enforce in some other places. Christianity, in fact, inherited the practice from three civilizations, Jewish, Greek, and Roman. . . . The custom for women to be veiled gradually fell into disuse in the West but was preserved in the East and among Moslems. Nonetheless, the use of the veil was still current in sixteenth century Spain, especially where there was Moorish influence. "In one of its religious uses the veil became the sign of the consecrated woman. In Teresa's time it caused no surprise or annoyance to see nuns with their faces veiled; this was often done by other women as well when they ventured into the streets." Accordingly, the veil itself did not necessarily mark the habit as Marian -- as the style could be worn by ordinary women and not only by nuns -- but its link to the Middle East and to first century Palestine was real. Our Lady is regularly depicted with a veil in both western and eastern artwork, and she indeed would have worn a veil. The early Carmelite habit, like the Carmelite habit of today, held that tie with what Our Lady really would have worn. In another sense, however, St. Teresa of Avila could have referred to the Carmelite habit as Our Lady's habit simply because she saw the Carmelite order as Our Lady's order, as she said in the sections quoted above. "His Majesty knows that I have nothing to rely upon but His mercy; as I cannot cancel the past, I have no other remedy but to flee to Him, and to confide in the merits of His Son and of His Virgin Mother, whose habit, unworthy as I am, I wear as you do also. Praise Him, then, my daughters, for making you truly daughters of our Lady, so that you need not blush for my wickedness as you have such a good Mother. Imitate her; think how great she must be and what a blessing it is for you to have her for a patroness, since my sins and evil character have brought no tarnish on the lustre of our holy Order." A few interesting points arise in the course of these references. One is the absence of any reference in these quotations to some of the legends, such as that of Simon Stock mentioned by Father Kavanaugh above. St. Teresa of Avila mentions Our Lady in connection with Jesus, and not in connection with any apparitions. Second is that these quoted references to Our Lady do not base her devotion on her own visions of Our Lady described in The Life. Why was it important to her that the Discalced Carmelites remember themselves as the Order of Our Lady, and their habit as Our Lady's habit? In the vision quoted above from The Life, it was the Lord who she said would raise the order up. In The Way of Perfection, she mentioned Mary in connection with a discussion of Jesus's love for women, including His mother. 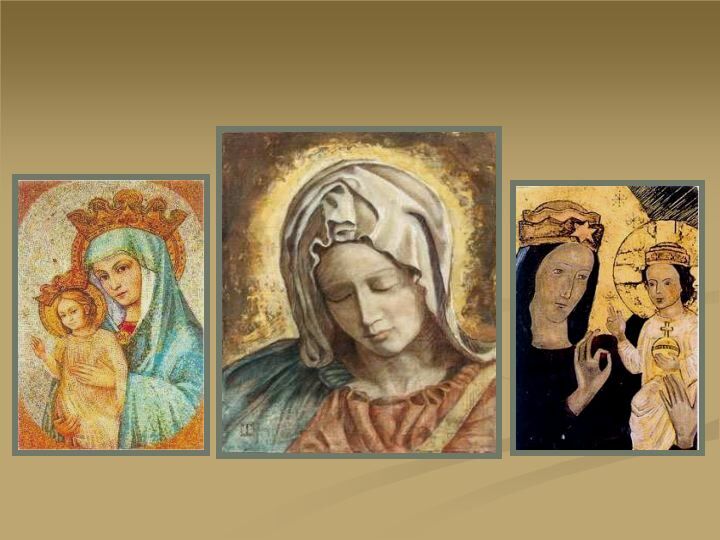 The reference to her as Jesus' mother, and to the nuns as brides of Christ, is in the context of encouraging them to live holy lives, remembering their connection with the mother of God. Graphics: (1)A collection of pictures of Our Lady of Grace, from the Divine Retreat of Ashram, Faridabad, India, the Divine Will Blog, and La Mésange; (2) St. Teresa of Avila interceding for the souls in purgatory, painted by Peter Paul Rubens, Flemish (1577-1640); (3) St. Teresa of Avila by Rubens; (3) Orthodox Church nun Nektarija Karajcic with two of the icons she wrote, from Der Spiegel, hat tip to Gerald Augustinus at The Cafeteria Is Closed; and (5) Orthodox Church nun from the website of St. Anthony's Monastery.